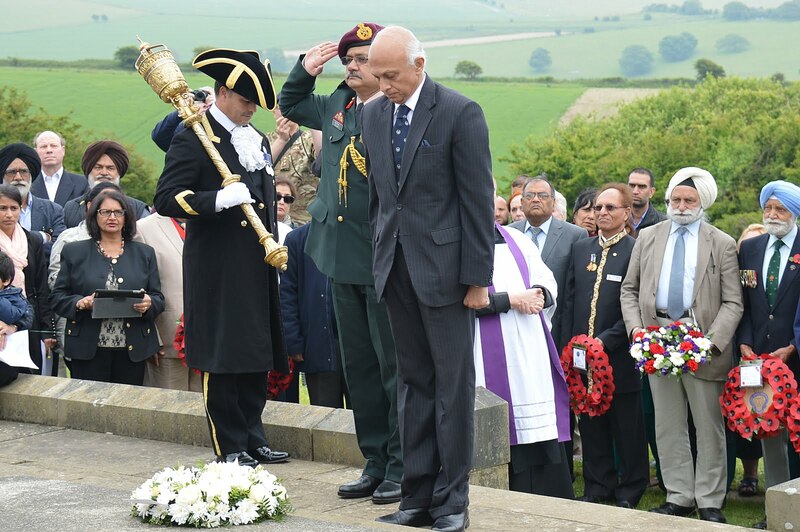 On Sunday 14th June the Chattri Memorial Group staged the 64th Annual Chattri Memorial Service at Patcham. 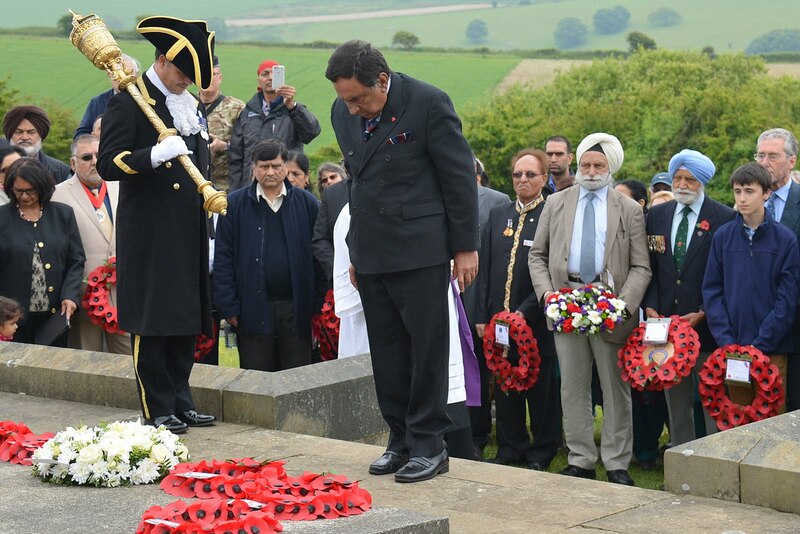 The welcome address, given by Davinder Dhillon, Chairman Chattri Memorial Group was followed by a procession of wreath laying, headed by the High Commissioner of India, Shri Ranjan Mathai. 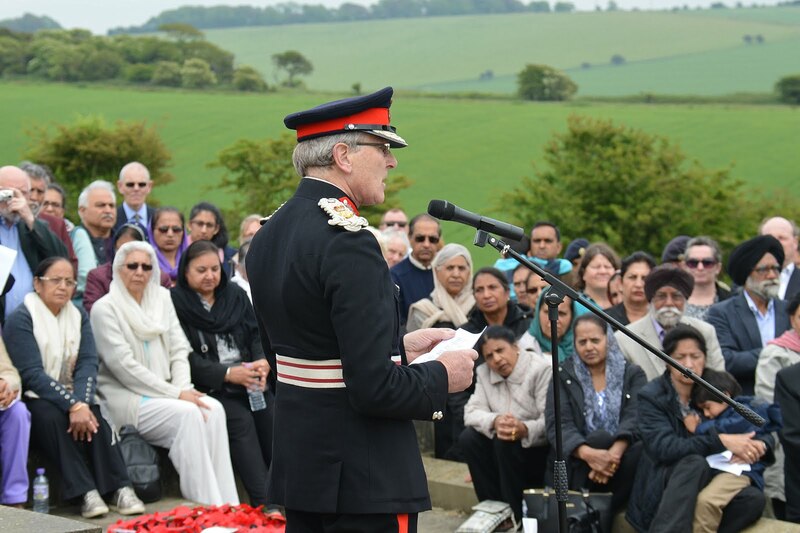 The service was also attended by local dignitaries the Lord Lieutenant of East Sussex, Peter Field, the High Sheriff of East Sussex, Juliet Smith, and the Mayor of Brighton and Hove, Councillor Lynda Hyde. 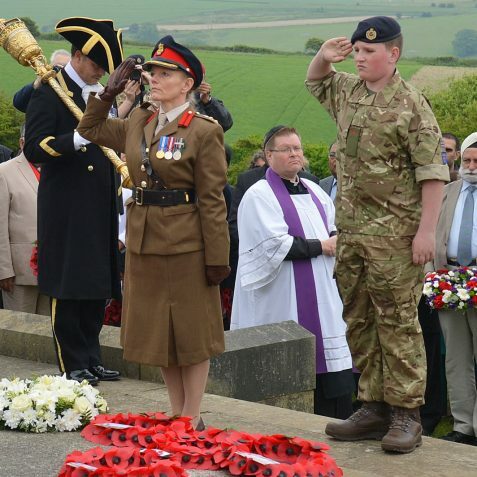 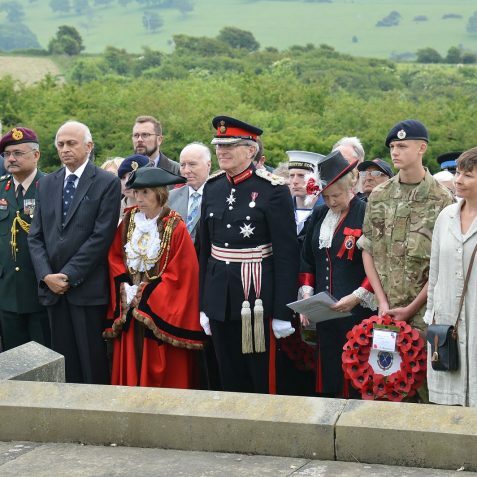 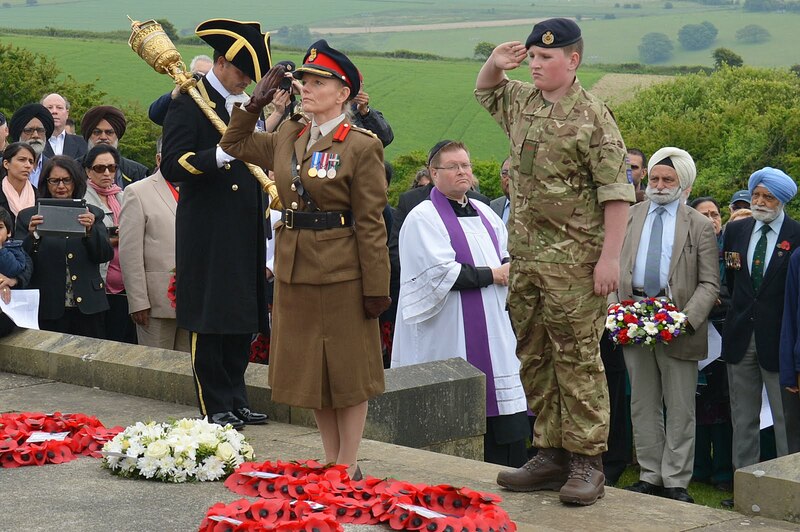 Amongst the diverse gathering at the service were Caroline Lucas MP, representatives of the British Armed Forces, Indian Army, the Royal British Legion, the Police and many local people, as well as those from further afield. 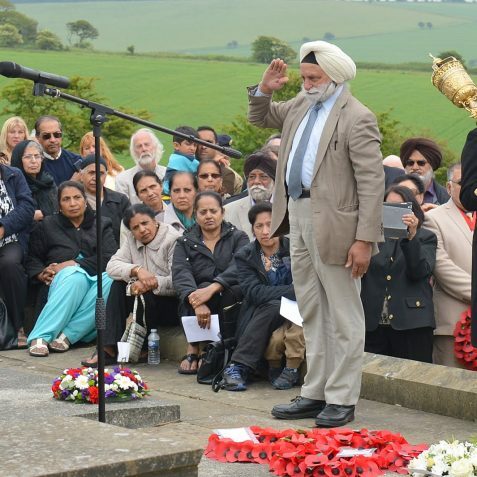 In WWI, the Indian subcontinent contributed 1.5 million men to the war effort – more than any other allied or German colony – and 4,300 Indians who had served on the Western Front were treated in Brighton. 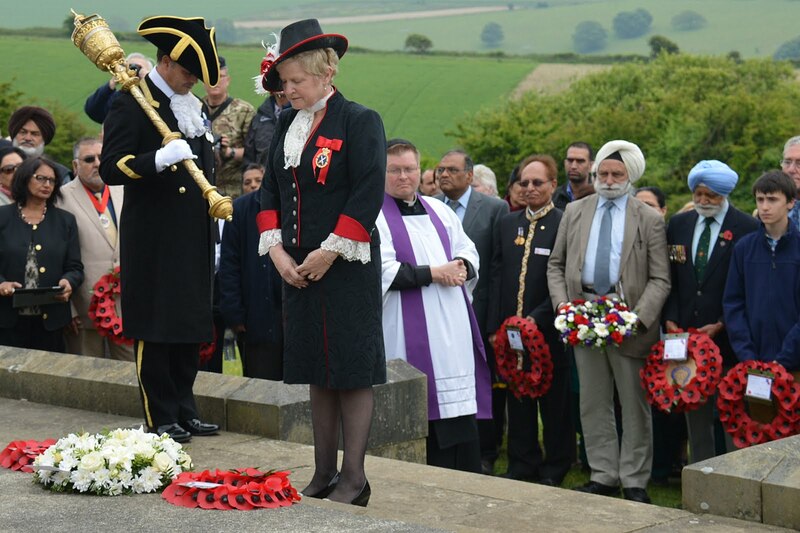 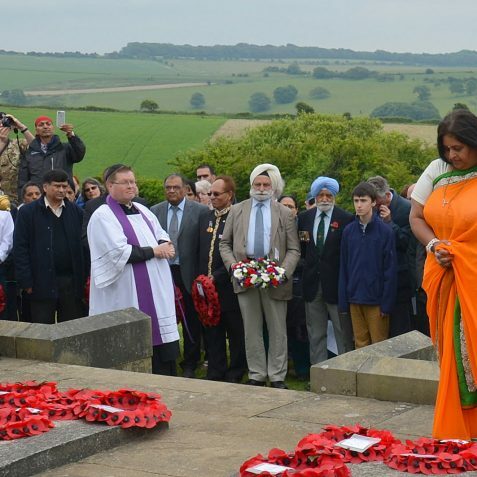 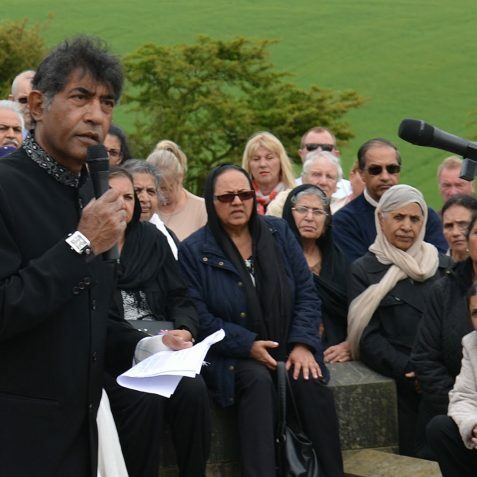 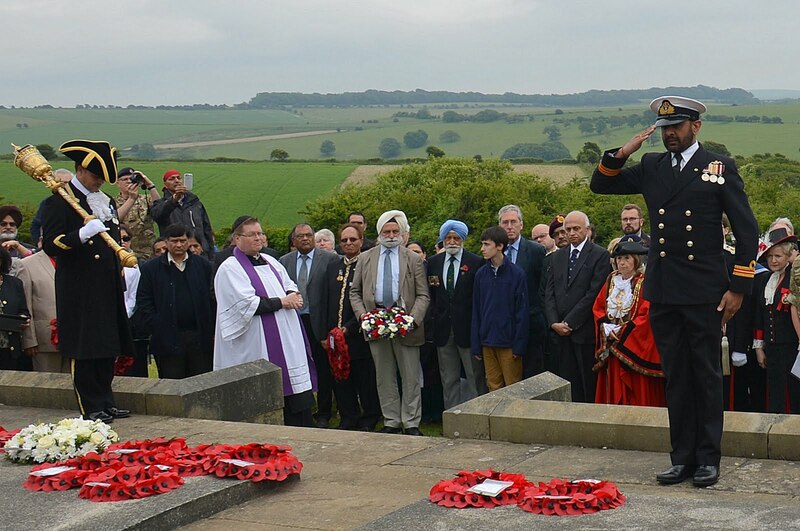 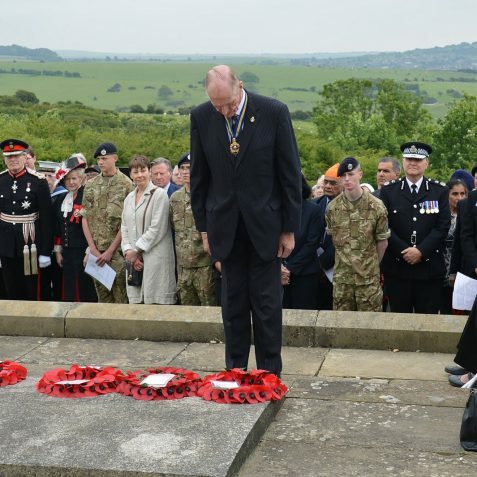 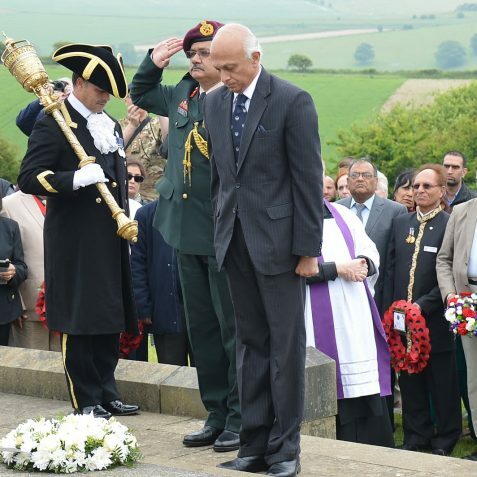 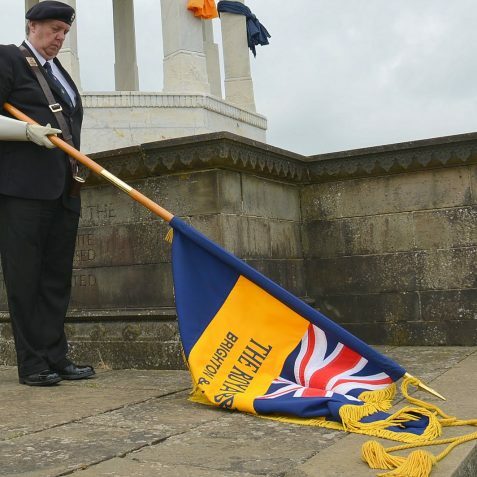 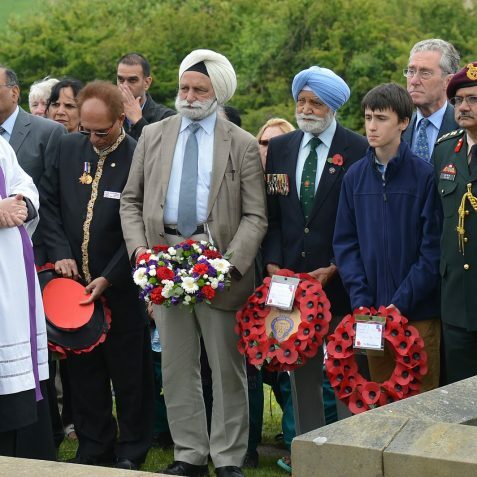 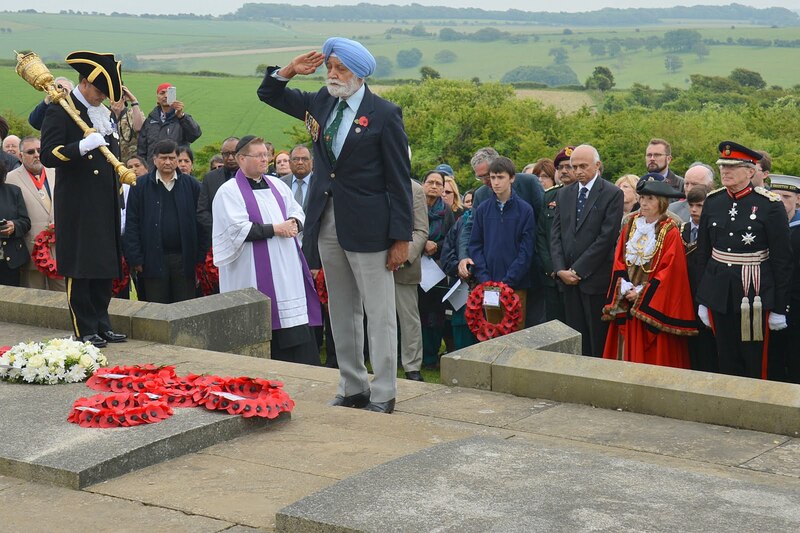 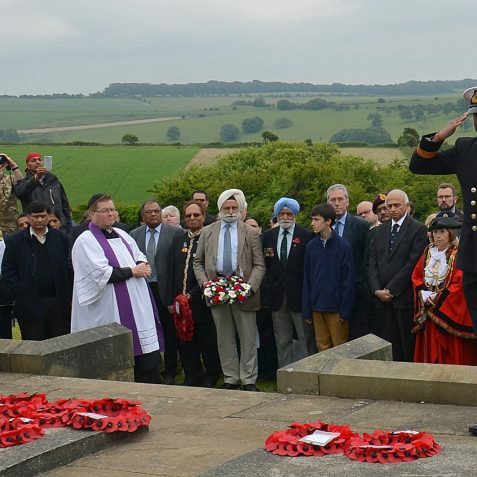 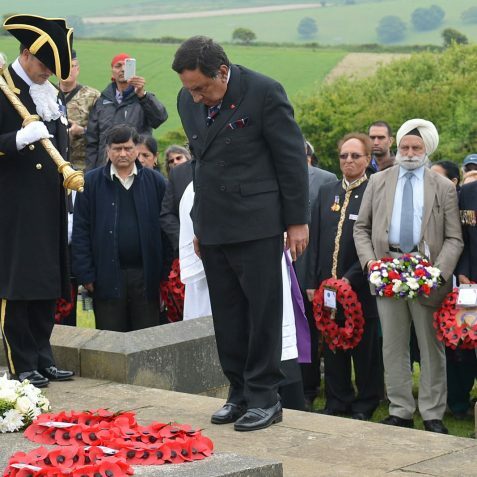 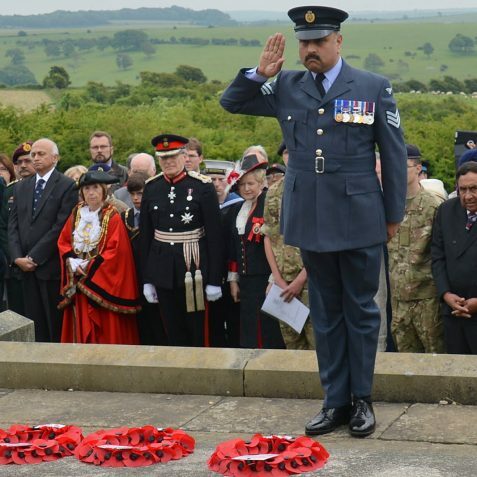 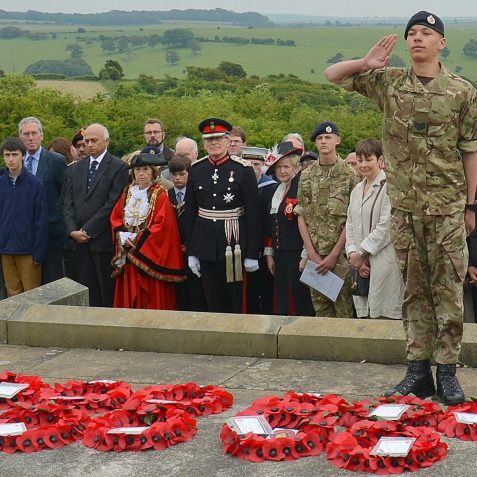 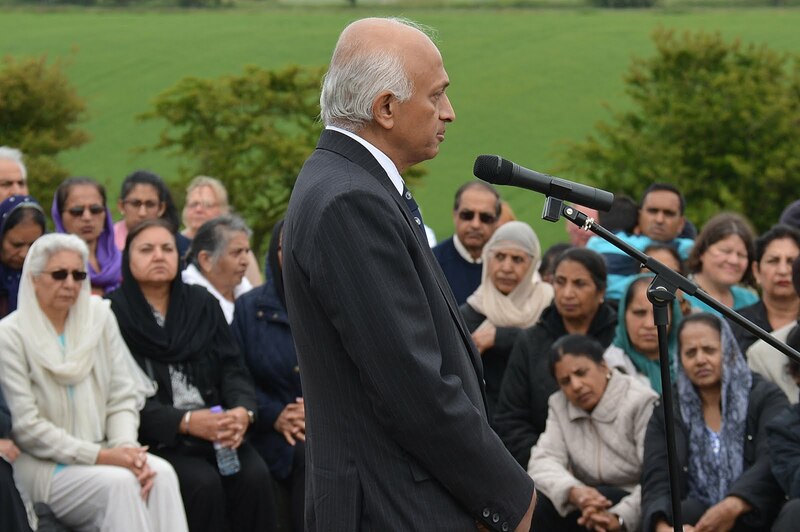 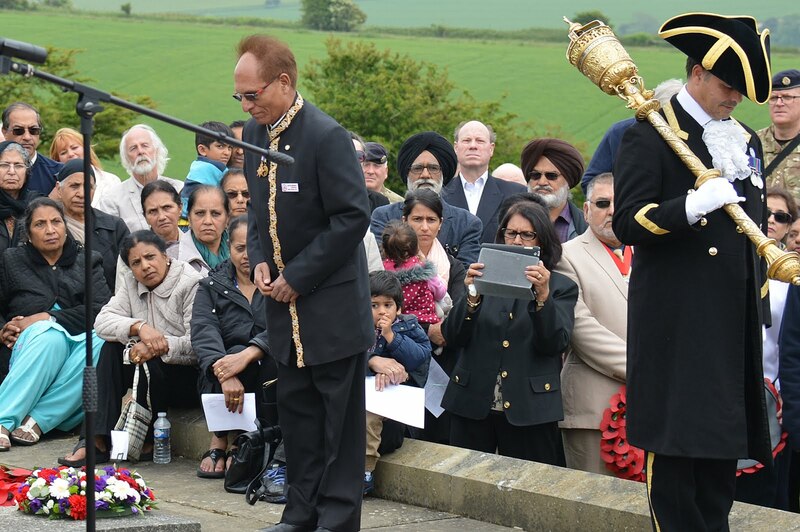 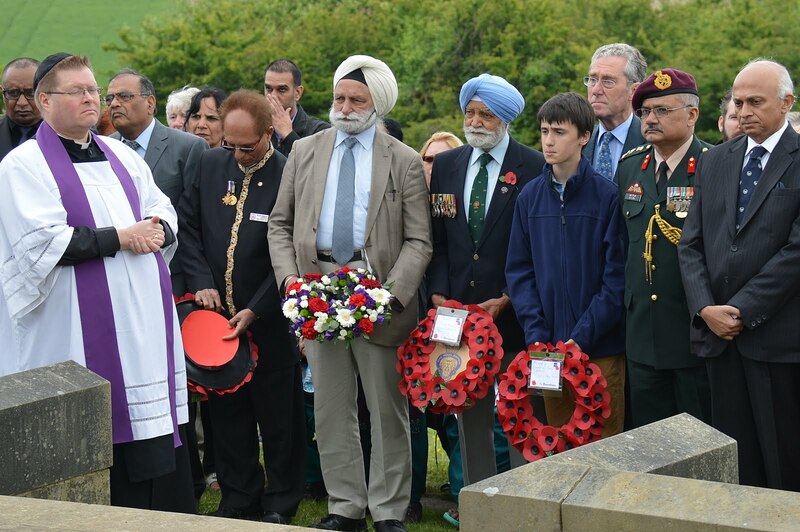 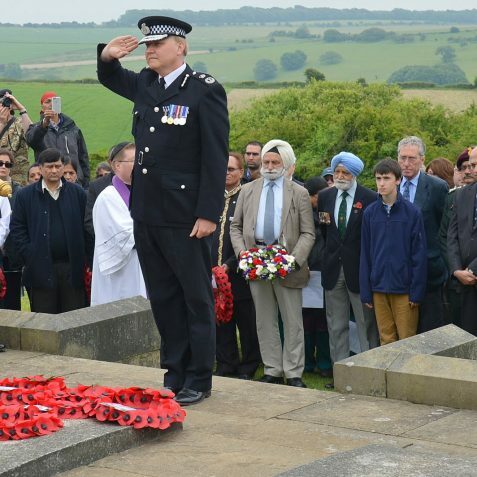 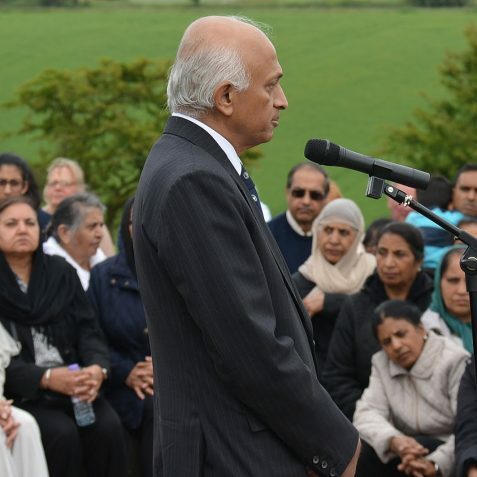 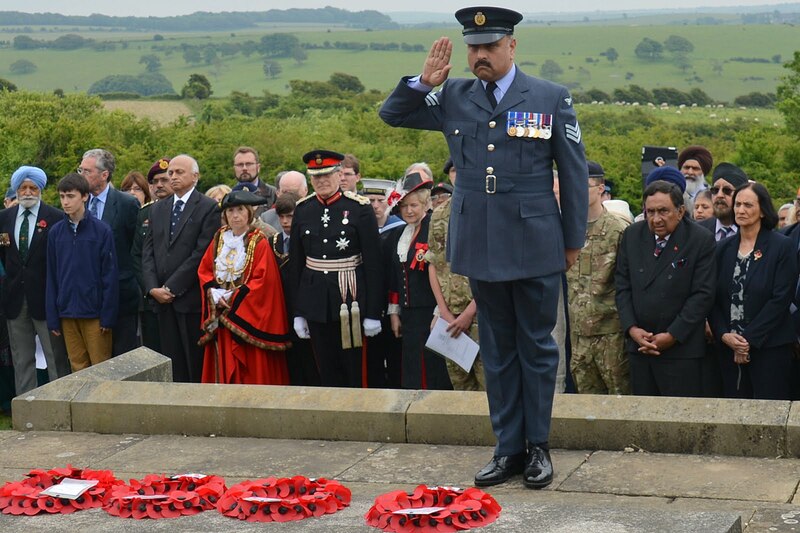 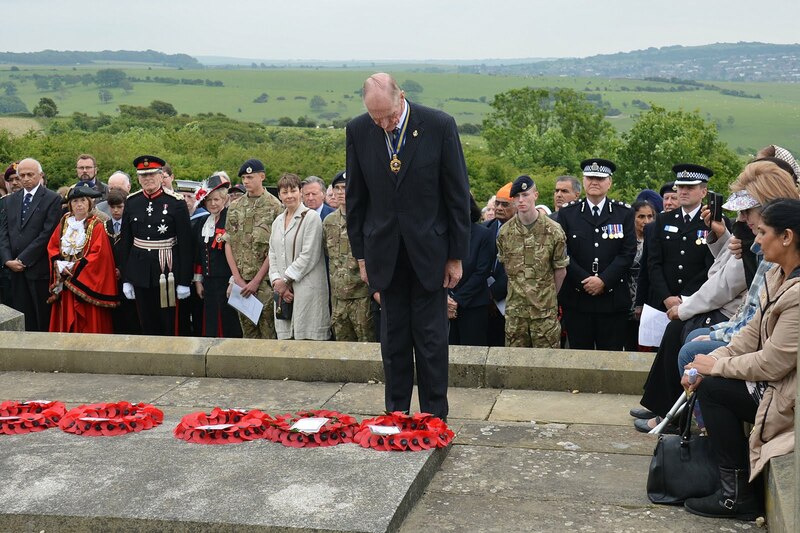 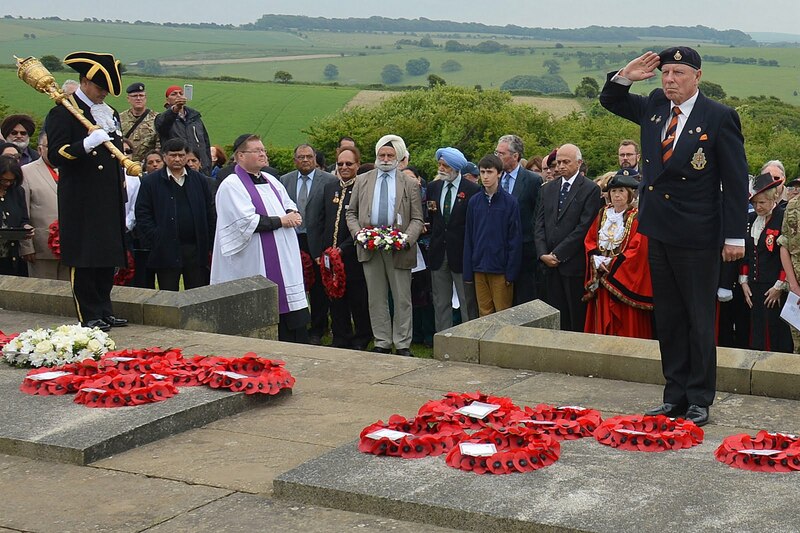 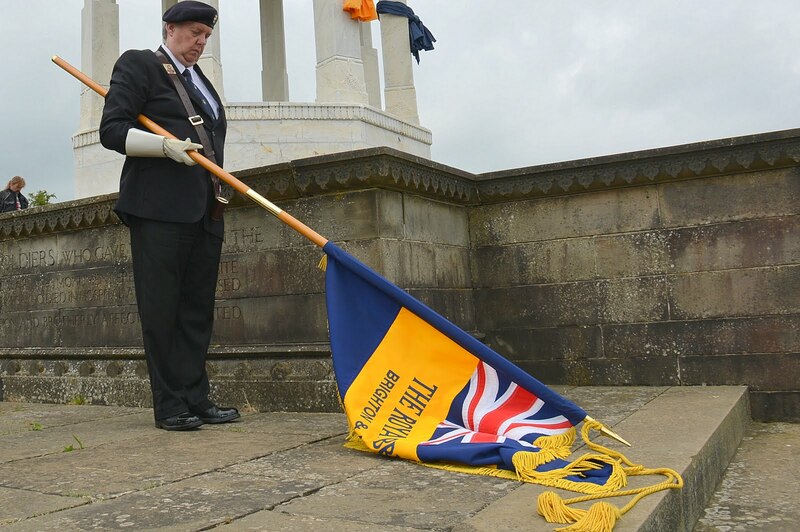 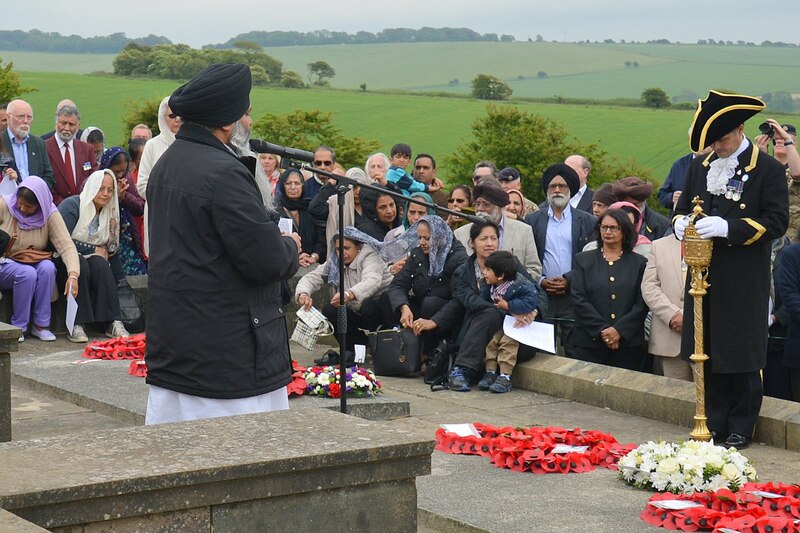 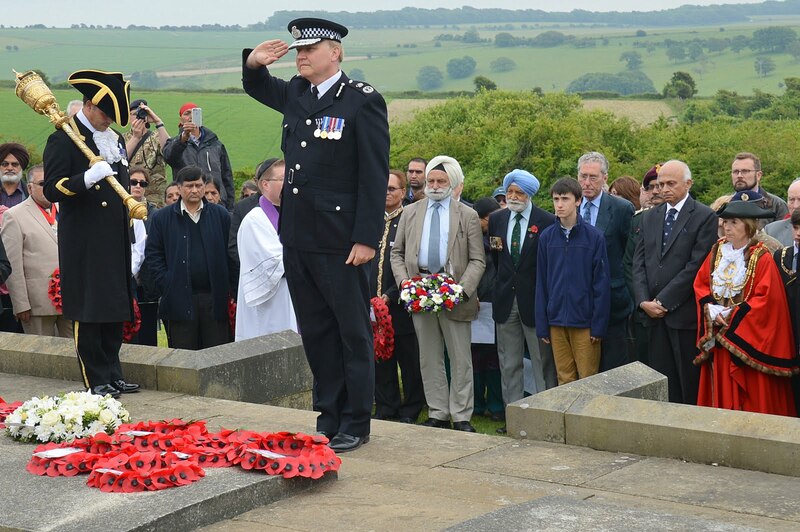 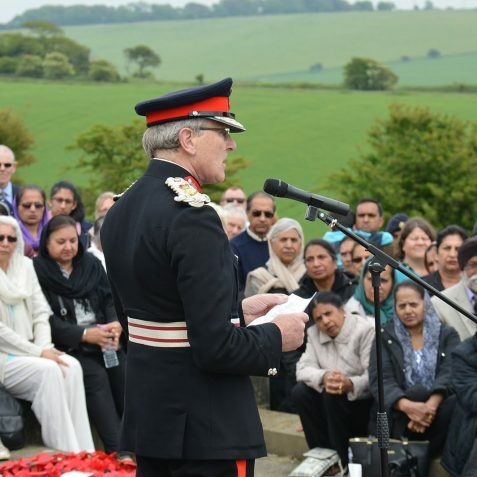 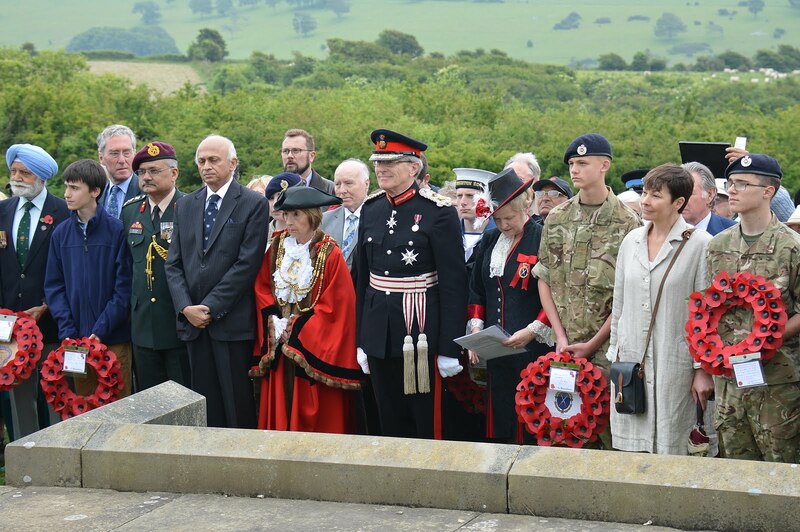 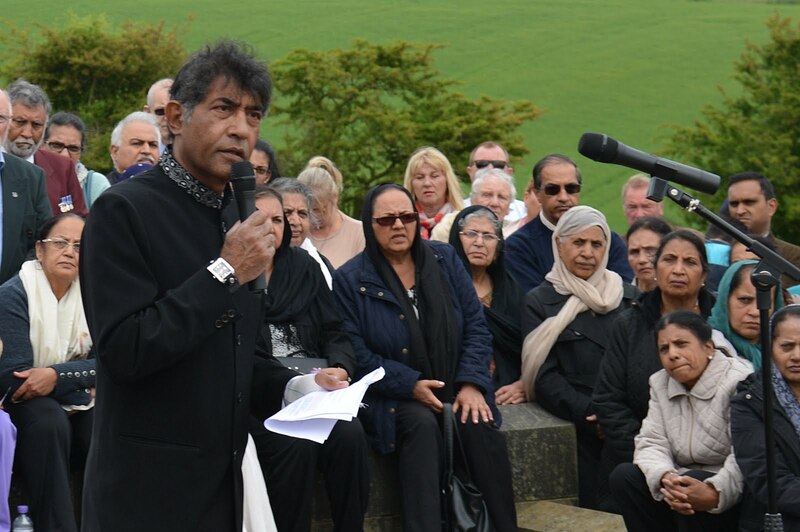 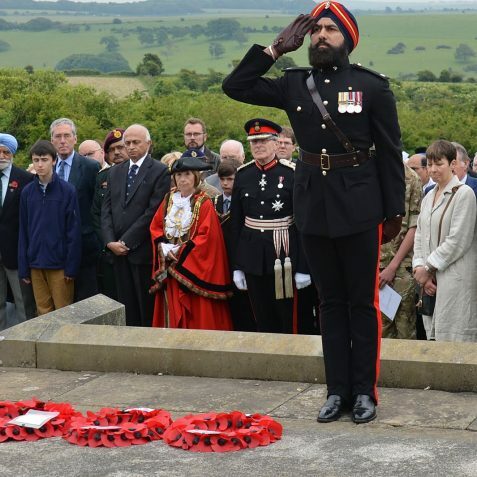 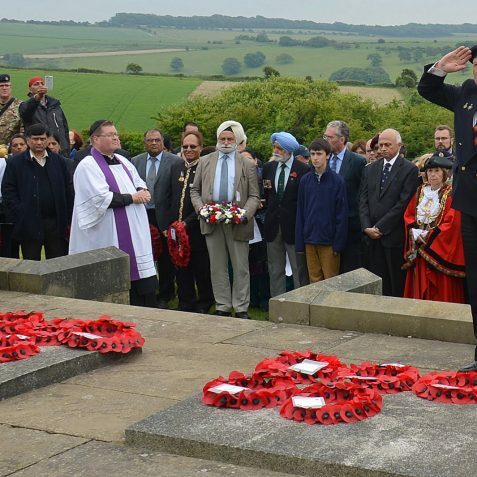 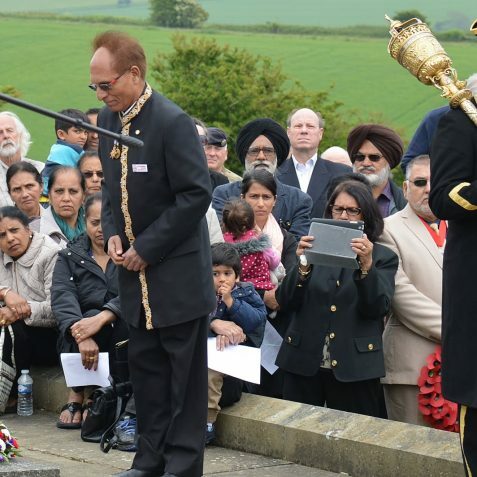 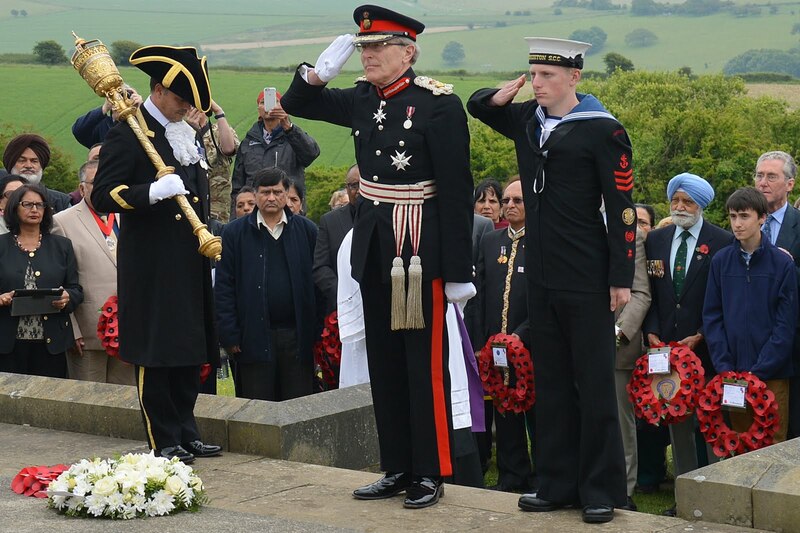 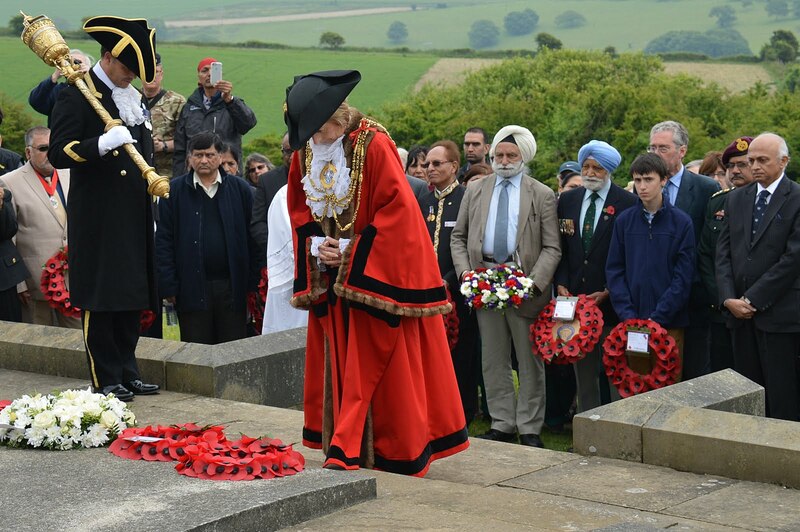 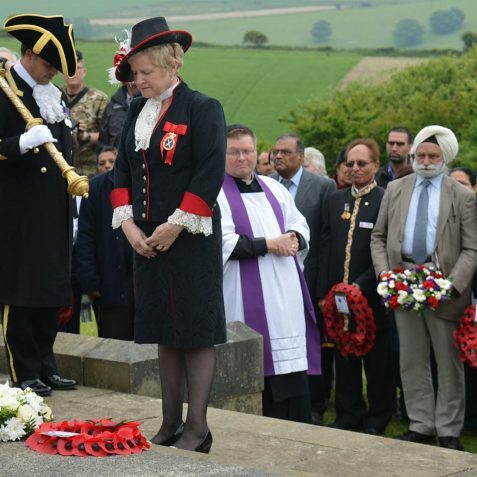 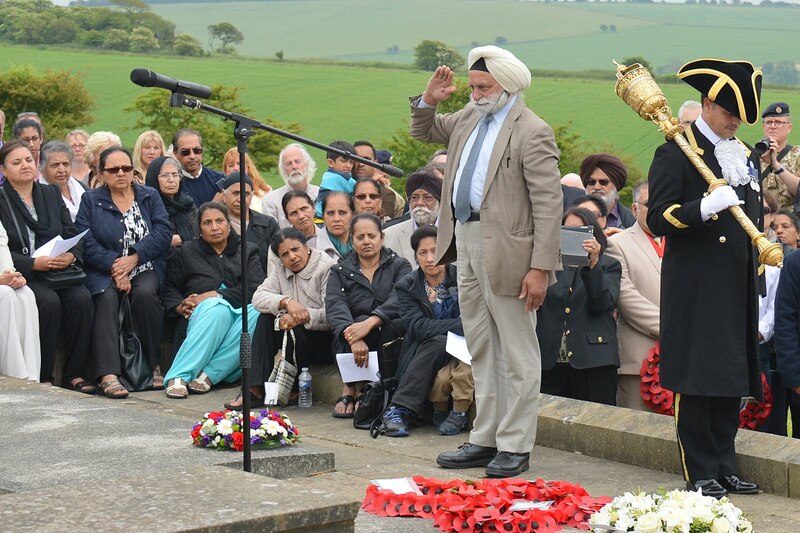 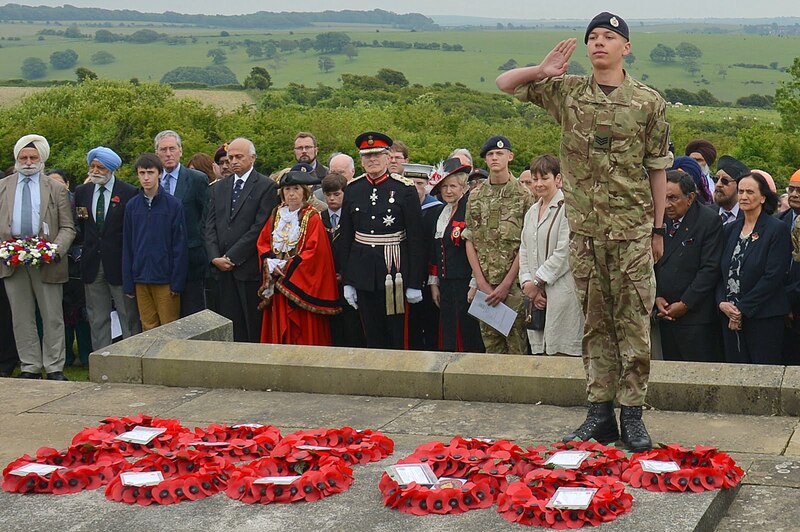 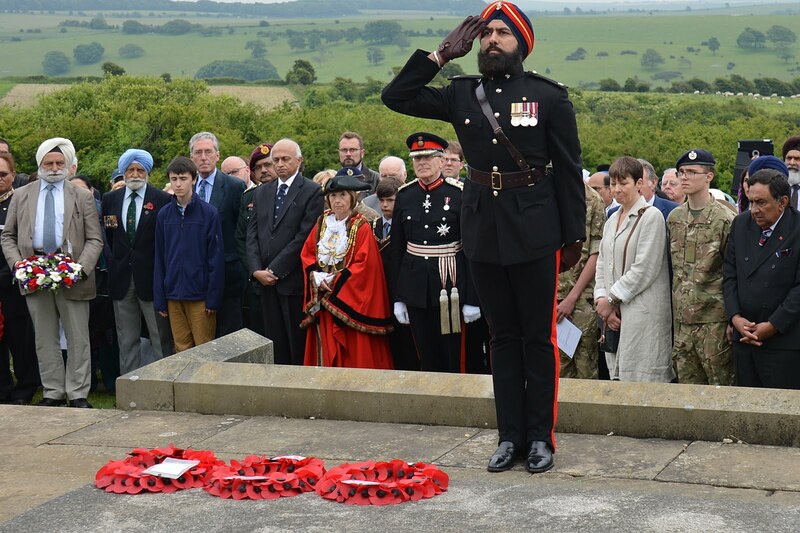 Every year at the Chattri Memorial at Patcham, there is a ceremony to honour those who died. 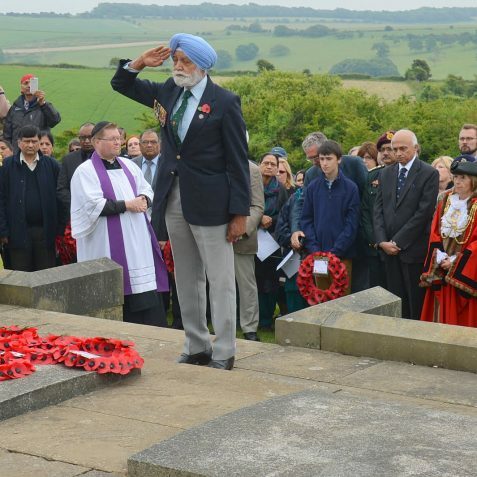 The Chattri was built on the site where the bodies of Sikh and Hindu soldiers who died of their wounds were cremated on outdoor slabs. 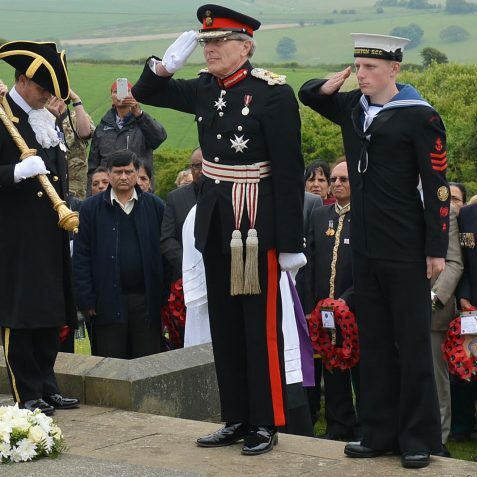 The first cremation was carried out on December 31st, 1914, and the last one on 30th December 1915. 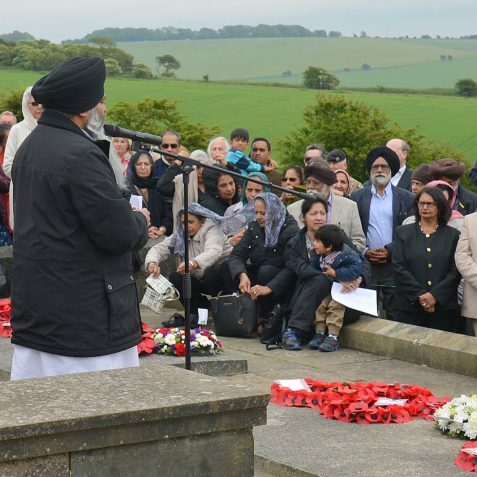 In total 53 Sikh and Hindu soldiers from the Brighton hospitals were cremated there. 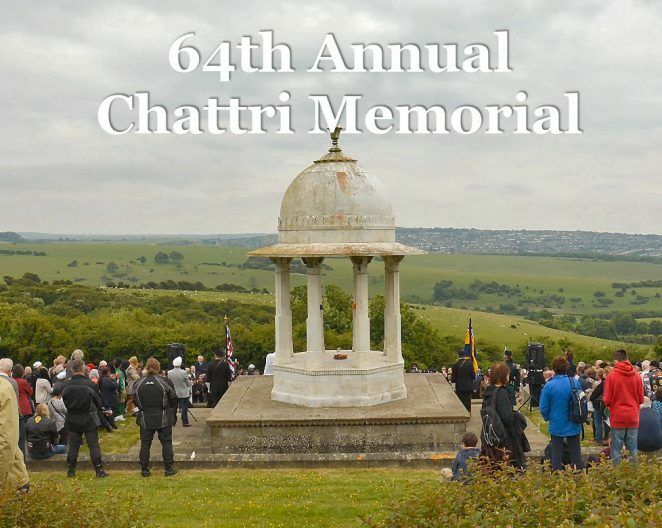 To those who do not know the history, this chattri, so essentially Indian in general design and in every detail, may seem a thing alien to the open down land scenery in which it is set. 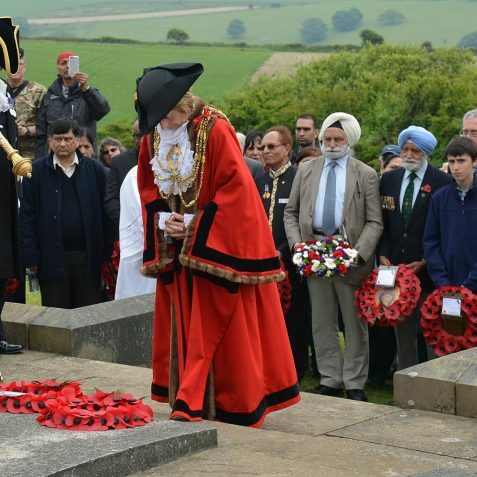 It is artistically appropriate that this should be so. 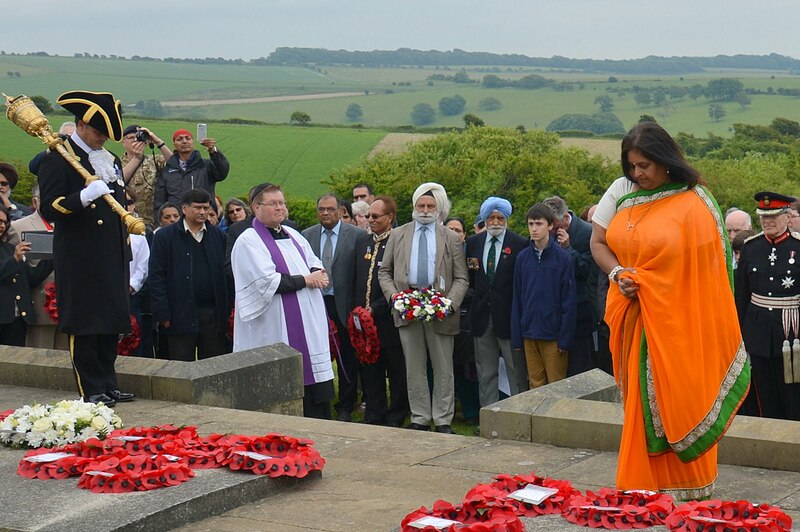 For East came to West in a strange romantic way when, on these Sussex Downs, the ashes were burned of Hindu warriors born in remote villages in far away Hindustan, for whom the wildest imagination could never have suggested at their birth that their funeral fires would be fanned by the winds that swept these Sussex hills.